May the New Year bring you Luck and Prosperity! This is the year of the YIN FIRE ROOSTER. The Chinese New Year begins on January 28th. 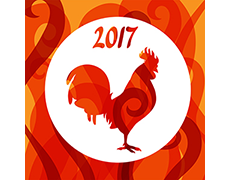 I will share more about what you can expect in a Fire Rooster Year in my Feng Shui Forecast for 2017, which will be available next week. For now, we can learn a lot from the Chinese culture about how to treat the “new” year, RESPECTFULLY. This includes our homes, paying our respects to ancestors, and visiting with family members and friends. Below are a few traditions that many Asian cultures take “very” seriously. Perhaps the world would be a better place if everyone followed suit. First off – all homes are cleaned thoroughly from top to bottom including carpets, drapes, cupboards, furniture and windows BEFORE the New Year. Also before New Year’s Day, homes are decorated with trays of tangerines and oranges, candies, dried fruits, plants and vases of fresh flowers, and wishes are written down on (red) paper. Too, money in red envelops is handed out to children and poor people. Red is considered the best color to wear for celebration as it symbolizes a bright and happy future. At the stroke of MIDNIGHT all doors and windows are throw open to allow the old year to leave. Firecrackers are also lit to send out the OLD year and to welcome in the NEW. In many countries lanterns are lit and allowed to float to heaven too. Day 1 is the “welcoming of the gods of heaven and earth.” People abstain from eating meat on this day to ensure a long and happy life. Day 2 is praying to ancestors and gods as well as the birthday of dogs, to remind people to be extra kind and to ensure that both people and animals are fed. Days 3 and 4 are for “sons-in-laws” to visit and pay their respect to parents-in-law. On Day 5 people stay at home to welcome the “God of Wealth.” It is considered bad luck to visit people on this day. Between the 6th and 10th days, the Chinese visit relatives and friends as well as temples to pray for good fortune and health. On the 7th day, farmers display their produce and make a drink of seven different vegetables. This is considered the birthday of HUMANS. Noodles are eaten on this day to promote longevity and raw fish is eaten for success. Day 8 is another family dinner and at midnight, the Chinese pray to Tian Gong, the God of Heaven. Offerings are made to the Jade Emperor on day 9, and relatives are invited to dinner on days 10, 11 and 12. After so many rich meals, the 13th day is a day of simplicity. Only rice congee and mustard greens (and bok choy) are eaten to cleanse the system. On the fourteenth day preparations are made to celebrate the Lantern Festival held on the 15th night.